Linen is a type of textile that is made from flax. This fabric is characterized by airiness and environmental friendliness. 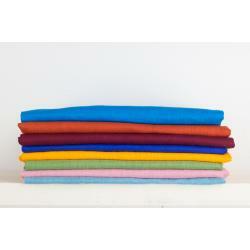 In addition, linen is also a strong fabric that does not fluff, and becomes softer as you wash the fabric. The fabric is perfect for making summer garments such as pants and shirts. But it can also be used for making curtains and bedding. Quality: Linen (100%) Width: 150 cm Weight: 255 g/m2 Product code: 4950053..
Quality: Linen (100%) Width: 150 cm Weight: 255 g/m2 Product code: 4950009..
Quality: Linen (100%) Width: 150 cm Weight: 255 g/m2 Product code: 4950006..
Quality: Linen (100%) Width: 150 cm Weight: 255 g/m2 Product code: 4950014..
Quality: Linen (100%) Width: 150 cm Weight: 255 g/m2 Product code: 4950001..
Quality: Linen (100%) Width: 150 cm Weight: 255 g/m2 Product code: 4950088..
Quality: Linen (100%) Width: 150 cm Weight: 255 g/m2 Product code: 4950004..
Quality: Linen (100%) Width: 150 cm Weight: 255 g/m2 Product code: 4950015..
Quality: Linen (100%) Width: 150 cm Weight: 255 g/m2 Product code: 4950032..
Quality: Linen (100%) Width: 150 cm Weight: 255 g/m2 Product code: 4950008..
Quality: Linen (100%) Width: 150 cm Weight: 255 g/m2 Product code: 4950034..
Quality: Linen (100%) Width: 150 cm Weight: 255 g/m2 Product code: 4950003..
Quality: Linen (100%) Width: 150 cm Weight: 255 g/m2 Product code: 4950077..
Quality: Linen (100%) Width: 150 cm Weight: 255 g/m2 Product code: 4950099..
Quality: Linen (100%) Width: 150 cm Weight: 255 g/m2 Product code: 4950002..
Quality: Linen (100%) Width: 150 cm Weight: 255 g/m2 Product code: 4950022..
Quality: Linen (100%) Width: 150 cm Weight: 255 g/m2 Product code: 4950026..
Quality: Linen (100%) Width: 150 cm Weight: 255 g/m2 Product code: 4950036..
Quality: Linen (100%) Width: 150 cm Weight: 255 g/m2 Product code: 4950039..
Quality: Linen (100%) Width: 150 cm Weight: 255 g/m2 Product code: 4950038..